Out of 952 breeds of sheep - only a select few qualify to meet the quality requirements of the wool used in the production of fine rugs. A special diet as well as optimal climate and altitude are provided as essential factors influencing the quality of the wool. The age of the sheep as well as the time of the year shearing occurs are additional important factors. Only the best section of the sheep's fleece is used for each rug. The shoulder wool is the longest and the most expensive. DETERMINES THE STRENGTH. NO TWIST SHOWS THE FIBERS PARALLEL; THIS IS VERY SOFT WEAK YARN. WITH MORE TWIST IN THE YARN, IT BECOMES STRONGER AND HARDER. SHOWING ITS NATURAL CRIMP WHICH GIVES WOOL ITS WONDERFUL RESILIENCE. Due to the spring-like properties of the wool fiber, wool offers greater bulk, density, elasticity, resilience and comfort and is able to retain its original appearance much longer than other carpetting materials. Wool is naturally both stain and soil resistant - making a wool rug easy to care for. The high moisture threshold and moisture-retention rate of wool fibers provides excellent natural resistance to flame, combustion and/or ignition. Additionally, wool's hydroscopic properties - which allow it to both absorb and release water vapor without any palpable wetness - help to modulate extremes in humidity and also provides natural resistance against static electricity. Wool is anti-bacterial as well as non-allergenic and non-toxic, and has been used for bedding, clothing and all types of insulation and floor coverings for thousands of years. It has been documented that the proximity of wool can actually reduce the human heart rate. Wool, especially in a rug or carpet, absorbs sound and dampens echo - creating greater intimacy and the conditions for more efficient communication. Even the sound quality of TV and stereo speakers is improved by minimizing reflected sound waves. A wool rug can appreciably absorb the impact of a fall - thus reducing subsequent injury - especially possible injury to the head. A child falling on a plush wool surface as compared to a fall on a hardwood or tile floor surface offers the likelihood of 2 entirely different scenarios. Your wool rug is a natural insulator that helps regulate the effects of extremes in temperature: cooling in Summer, and warming in Winter - thus contributing to a savings in energy costs. Wool carpet has been shown to absorb common pollutants i.e. : formaldehyde, sulfur dioxide etc., and to prevent their re-introduction into the environment. This process is ongoing over time and is one of the many inherent properties - and benefits - of wool. 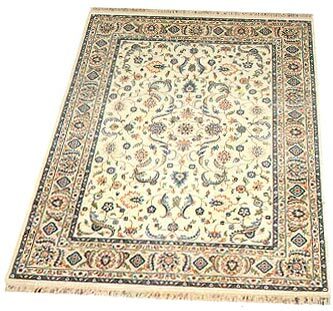 Although wool is the best material for the rug's pile, it is not a good choice for the foundation (warp & weft). A rug made with a wool foundation will not lie flat and will be crooked (especially after washing). Only the nomadic tribes still use wool for foundations, mainly because they do not own land nor stay in one place long enough to grow cotton. Cotton makes the best foundation. Silk makes a good warp thread if extreme thinness is desired. 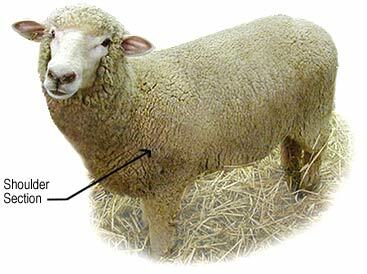 A wool foundation can be recognized by its fringe which is darker and thicker than a cotton fringe (warp). Today's synthetic (chrome) dyes are excellent and are not to be confused with the earlier unsatisfactory synthetic (aniline) dyes of the past. In some weaving districts talim cards are used instead of a cartoon. One person reads the color and number of knots to several weavers. Machine stitching can always be found along both sides of the rug. The stitching is normally dyed to make it less noticeable. The design is often vague and indistinct. The back is covered with perfectly straight lines. The fringe is almost always sewn on and not an extension of the warp. Sculpturing: Carving and incising the rug surface.